An article by The SCUMM Bar, posted on August 18. 2004. An Interview With Tim Schafer, from Ultimate PC, August 1998, issue #12. LucasArts may have created some true classics in the past, but Mexican-inspired Grim Fandango is easily their most classic to date. We sent UPC reporter David Gibbon to interview the game's producer, Tim Schafer, and find out more about this truly spectacular, epic adventure game. LucasArts as Tim Schafer. As LucasArts' key producer, Tim is a man who knows a thing or two about creating ground breaking adventure games. He worked on Full Throttle, not only producing it but also writing the whole script, coming up with the original concept and working on the game design. Full Throttle, an original adventure that took place in a futuristic World populated by motorcycle gangs, became one of the company's most successful products and earned Tim a whole host of well deserved accolades. After finishing Full Throttle Late '95, he immediately turned his attention (well, maybe not quite immediately) to something that had been in the back of his mind for a while. Tim had the idea of creating an adventure using skeleton-Like dolls based on papier-mache characters from his favourite films and, after a good deal of thinking, he came up with a surreal tale of crime, corruption and greed (sounds good already?) in the Land of the Dead. Combining elements of Classic film styles and Tim's genius, you play the part of Manny (a spoof Grim Reaper) who is employed by, get this, the Department of Death! Manny is a kind of taxi driver who picks up people in the Land of the Living, brings them to the Land of the Dead, and sets them off on a four year journey across the Underworld - a route all souls must endure before they can rest in peace. Stuck in the most dead of deadend jobs, Manny wants to move on to better things, but he can't do so until he has made enough sales. He wants to attract a better class of clientele, but white trying to do so he ends up embroiled in an embezzlement ring. He decides to steal a prime prospect, setting in motion a chain of events that threaten both his job and his soul. Set in a completely 3D World with multiple camera angles, huge characters and a Location count that puts Monkey Island to shame, we sent UPC man David Gibbon to speak to Tim Schafer and find out more about the most ground breaking PC adventure game ever. UPC: Graphically, Grim Fandango is the most visually stunning adventure game ever. How you do set about achieving such an amazing level of realism? Tim: Well, we were lucky enough to get nine of the best character animators to ever work on a computer game, in my opinion, and then made a really buff (brilliant!) game engine that was capable of handling the demands that those artists made on it. UPC: I understand the inspiration behind the graphics came from papiermache models used in the Mexican Day of the Dead and the Tim Burton film, the Nightmare Before Christmas? Tim: Yes, I have always been interested in Mexican Day of the Dead art because of its comically morbid style, and I just wanted to see those characters come to life. To animate the Mexican folklore characters was the first idea. The idea to do it in 3D came later, after looking at those characters for about two seconds, it was like a Light bulb went on and we said, hey - those littte skeletons would look great in 3D! UPC: How many people worked on the graphics and for how long? Tim: Nine animators, Five room builders, two texture artists, one concept artist, all working for a little over a year. UPC: Following Full Throttle, you decided to make the leap to 3D from 2D graphics. How much did this change your approach to adventure game design? Tim: As far as designing elements like the story and the characters, our approach to game design hasn't changed at all. The underlying world of the game is the same, whether you describe it in two dimensions or one. But, when it comes to gameplay, your thinking has to change dramatically when you're making a 3D game. When the player is moving a character through a 3-dimensional space, they tend to re-orient themselves to the perspective of the character, rather than the 2D perspective of the screen. They think of the attacking monster as being "to the left of me" as opposed to "in the left-hand corner of the screen." And the thing that's desirable about that change in perspective lies in their next thought, which wouLd be something like, "turn and shoot it!" instead of just "click on it with the mouse, FAST!" That's why I think a 3D game is a more immersive experience. UPC: Manny even changes costumes during the game? Tim: Manny has seven different outfits in the game. He's like a little dead Barbie doll. The costume changes are cheap in 3D, and they help show the changes Mannys character goes through dunng the game. UPC: With a total of 50 characters in the game, will they all have a part to play in the game? Tim: Yes they do. Take it from me. I had to write dialogue for all of them! UPC: How much interaction can there be between the player and the other characters in the game? UPC: Did you have different people doing the voice-overs for each character? Tim: All of the main characters are played by different actors, but sometimes an actor will do one big part, and then also do a smaller part in a different section of the game, in a different voice. Tim: Our star is Tony Plana, who starred in the Oliver Stone film "Salvador," as well as appearing in "JFK" and "Havana." Our female lead, Maria Canalas, had a major part in "Mi Familia." Everyone on the cast is an experienced Hollywood actor, and you'd probably recognise their voices, but maybe not their names. LucasArts has always cast that way going for the talented professionals who can give a performance that really suits the character - instead of going after big names that look good in ads but just don't fit in to tile world of the game very well. UPC: In the game, all of the characters are deceased. As such, how do the Characters in the game experience danger? Tim: That was a problem for quite a while, actually, until we thought of "Sprouting." The idea is you call get shot with this dart that injects a kind of chlorophyll-ike substance into your bones. It spreads out through the pores of the Skeleton like a fast growing vine, eventuatly sprouting out into wild Flowers that completely consume the victim until he is just a bed of marigolds lying on the ground. It's like getting sent back to the land of the living to start over. UPC: As the game has 90 different sets, what kind of environments can we expect to experience? UPC: Some of the locations look incredibly intricate. Was each set initially drawn on paper and then put onto computer using a 3D package? Tim: Yes, all the sets were first designed in 2D by Peter Chan, who was lead artist on Full Throttle and Day of the Tentacle. Then Famdango's lead artist, Peter Tsacle, put together a team of environment builders to take those drawings and build them in 3D. UPC: Will the environments be interactive? Tim: Yes, they are all interactive, even though they are pre-rendered. We wanted the game to have rich detail, so we couldn't render the backgrounds on the fly, but even though they're pre-rendered you can still walk into them, move behind objects, through the trees in the forest, you can pick up objects, etc. UPC: Some of the sweeping camera angtes in the game look truly spectacular. In all, how many camera angles does the game have and just how did you achieve this? Tim: There are about 250 different interactive camera angles in the game, and many more in the cut-scenes. We storyboarded every shot in advance, so when the set builder made the set, he knew what the Camera angles were going to be, so he knew where to put all of the detail, and where to leave it out. UPC: The story and the lines the characters have are superbly written. How long did it take to write the script and just how large is it? Tim: The interactive script has about 7000 lines of dialogue. I wrote a little bit of it slowly over time untill last October, and then wrote the bulk of the titles in one long, three-month cram session. UPC: One of the great Features of the game is the excellent humour in it from start to finish. As the script writer, do you write all the comedy? Tim: Yes, and I've written all the dialogue for LucasArts games, like Full Throttle, half of Day of the Tentacle, and a third of the first two Monkey Island games. UPC: As the gameplay in an adventure game is critical to its success, I understand you took the decision to make Grim Fandango non-linear? Tim: Well, we've always tried to make our games non-linear, and the farthest we ever took that was probably The Secret of Monkey Island 2: Le Chuck's Revenge. That game was crazy. You could almost solve all the puzzles simultaneously. But you can take that too far and really confuse people to the point where it's just not fun. The good thing about linearity is that it focuses game play in one area, and then moves you to the next. But if all of the puzzles are linear, and you get stuck on one, you can't do anything else until you solve it. So what we tried with Grim is to have short, linear strands of puzzles, grouped side by side so that the strands can all be worked on at once, and then link those non-linear strand collections into a Linear chain. So you have linearity, wrapped inside a ball of non-linearity, connected with ligaments of linearity again. UPC: How will the game's interface work? Tim: The game's interface is a literal one, in that there are no Symbols or icons or metaphors on the screen. No cursor, for example, to indicate objects of interest. Instead, Manny indicates the objects of interest by looking at them. You see his neck crane and his head tilt as his glance changes from object to object as he moves about the room. You move Manny by driving him around with keys, like in Tomb Raider or Resident Evil. And when he's looking at an object you can examine it, or use it or pick it up. Instead of icons for Manny's inventory objects, you actually see a close-up of Manny's coat where he pulls out the objects and you see a close up of each thing he has. So, in a sense, Manny IS the interface. UPC: Grim Fandango must be one of the largest adventure games ever. Just how large, in terms of gameplay, is it? Tim: There's no way to tell, but I'll just say this: It's huge. To keep it on just two CDs, we really had to learn a lot about compression techniques. UPC: As producer, what exactly was your role in the development of the game? Tim: To come up with the original idea, the basic design, write the dialogue, put the team together, and manage the team to the project's completion. 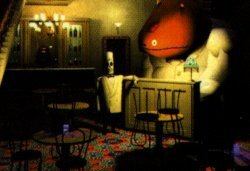 UPC: As Grim Fandango is the most ambitious graphic adventure that LucasArts has ever developed, what would you say is the game's most outstanding qualities? Tim: What we're shooting for is something grand, something epic, like nobody's ever seen before. And also, something that's very, very fun. With graphics to die for, Grim Fandango draws its unique style from Mexican Day of the Dead movies and the film Nightmare Before Chrismas, showcasing an approach never before seen in an interactive title. Characters come to life as skeletons depicted in a primitive yet very realistic folk-art style, thanks to Tim Schafer's inspiration from two technically-advanced animated movies. One of the films that inspired Tim Schafer is The Nightmare Before Christmas. Directed and created by Tim Burton whose other efforts include Batman and Beetlejuice, the movie was seen as a technical marvel by all. This innovative animated feature was the first ever to employ stop-motion animation and used skeleton characters throughout. Stop-motion animation is the same technique used by Nick Park to create Wallace and Gromit. For Burton's movie, it involved painstakingly creating each character from pipe cleaners and plastic. Then, to animate them, each character in a scene was moved a fraction for each take. A total of 24 shots were needed per second and the movie's total duration was 74 minutes so you could say it took a hell of a lot of work! The film tells the story of the Pumpkin King of Halloween Land, a skinny skeleton named Jack who discovers Christmas Land quite by accident. This bright and cheerful place is a far cry from Jack's dark world of ghouls and goblins. He is impressed and decides to make Christmas his own holiday. Santa Claus is kidnapped, and soon Jack is airborne guided by Zero, the red-nosed ghost dog, delivering presents to kiddies around the world. Unfortunately for Jack, some of the toys come alive and scare the wee ones out of their wits. Everything hails on Jack to save Christmas. The Nightmare Before Christmas was first dreamt up by Tim Burton over ten years ago when he was working for Walt Disney. Wholly funded by Disney, the ground breaking movie was considered a commercial and artistic risk, but the track record of Burton and the success of Disney's other animated releases ensured the money was there. And, thank to Burton's amazing vision, it's a risk Disney will be pleased they took, as the movie raked in over $60 minion at the box office.